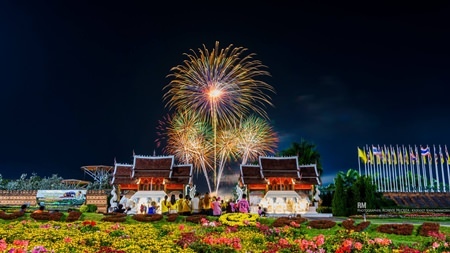 The colorful traditional Shan or Tai Yai festival called Poy Sang Long begins March 27 at Wat Ku Tao behind the Municipal Stadium and at Wat Pa Pao on Manee Noparat Road from April 4 -6, 2015. 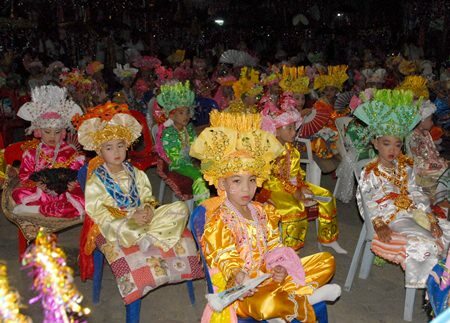 The colorful festival sees young boys, usually between the ages of 7 -14 ordained as novice monks. The three day festival begins with the boys being feasted by their families before parading to the temple to have head and eyebrows shaved (to remove all vanity) and anointed with lustral water. The parade is a vibrant affair with the boys accompanied by family and friends and musicians giving their support. The second day sees the boys donning white turbans before parading to the temple with dancing and drumming from participants. The final day the boys are dressed in finery with faces powdered and made up to become “Bejeweled Princes” carried on thrones atop the shoulders of their male relatives. They will then enter the temple to be ordained as monks and remain for at least one month as they learn the pillars of Buddhism. This colorful festival is a popular event and Manee Nopparat Road is often extremely crowded during those days so alternate routes are advised. 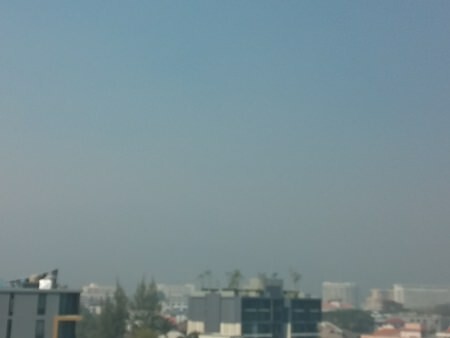 Haze filled the skies of Chiang Mai on March 21, 2015. Late afternoon thunderstorms on Monday, March 23 and Tuesday, March 24 brought localized heavy rains, winds, some flooded roads but cleared the smoke and smog from Chiang Mai’s skies. The area around Tha Pae Gate, Chang Klan Road, Charoen Prathet and Sridonchai Road saw flooded roads during the heavy rains which cleared after the rain subsided. Before the rains hit the government had been sending helicopters to spray water in the air and put out fires in the region along with help from two Chinook helicopters from Singapore. The Deputy Governor chaired the working task force to monitor the situation and coordinate firefighting efforts. Chiang Dao was particularly bad just before the rains with over 140 hotspots showing on satellite. The government has called on all government officials at all levels, from the local village leaders to the Department of National Parks to educate and prosecute those who start fires. From February 15 to March 20 surveillance showed hotspots in every district except Sarapee and over 200 hotspots at any one time. Heavy localized rains are expected to continue through Friday, March 27 which has helped bring pollution levels down to normal. 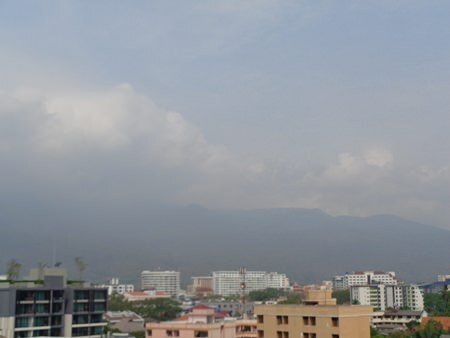 Thunderstorms have cleared the skies over Chiang Mai, with light clouds and low pollution levels at PM10 40 on March 25, 2015. Gary Soles of the Rotary Club of Kamloops (2nd left) instigated the water filtration system for the Ban Pao Witiyakhan School with the aid of members of Chiang Mai International Rotary Club and the Rotary Club of Chiang Mai Thin Thai Ngam. Rotary Clubs from Chiang Mai and Canada worked together to provide a water filtration system for the Ban Pao Witiyakhan School, a very well administered school that supports disadvantaged hill tribe children. Through the combined efforts of three Rotary Clubs; Rotary Club of Kamloops West, British Columbia, Canada, Rotary Club of Chiang Mai Thin Thai Ngam and Chiang Mai International Rotary Club (CMIRC), this school will have a working water filtration system. The project became official at the regular meeting of Chiang Mai International on March 17, 2015 when Gary Soles from the Rotary Club of Kamloops presented 28,000 baht to CMIRC for disbursement. 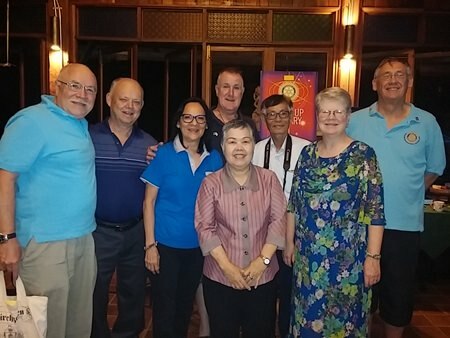 Gary Soles from the Rotary Club of Kamloops visits Thailand almost every year and has become aware of the good work done by Rotarian Hope Watcharaprecha and her club, The Rotary Club of Chiang Mai Thin Thai Ngam. He mentioned that his club was looking for a project to support. She recommended the Ban Pao Witiyakhan School. In conjunction with the Chiang Mai International Rotary club due diligence was conducted and it was decided to proceed. Chiang Mai International Rotary Club will contribute the water filter system. Rotarian Colin Jarvis made the contacts and was able to secure an Actiwa Swiss water filter system with manual backwash with the help of a donation from the GOL Iluminado Foundation of Brazil. At the CMIRC meeting the agreement between the Rotary Clubs and the school was signed. On the 18th of March the first disbursement was made and the project works towards completion. Royal Flora Rajapruek will be holding a candle light ceremony to honor HRH Princess Maha Chakri Sirindhorn on her 60th birthday on April 2, 2015. The park will then hold a fireworks show after the ceremony. This event, which will be free of charge, is open to all members of the public and will begin at 6 p.m. Other events include an official government ceremony at Chiang Mai Convention Center on April 2 at 9 a.m. and events at Tha Pae Gate in the evening. The new Tourism Authority of Thailand Office held a grand opening ceremony on Tuesday, March 24, 2015 with representatives from tourism related organizations around Chiang Mai dropping in to offer their congratulations. The new building is a chic modernistic building with traditional Thai touches. 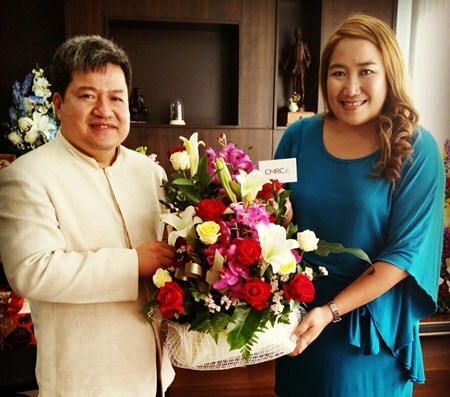 Here Utsanee “Aey” Sripet from Chiang Mai Rock Climbing Adventures offers a congratulatory bouquet of flowers to TAT Chiang Mai head Wisut Buachum. Earth Hour will be held on March 28 from 8:30-9:30pm and the local officials encourage everyone to take part by turning of their electrical gadgets and lights for the one hour. In Bangkok key tourist attractions as well as important roads such as Silom will see their lights turned off for the hour in a bid to raise awareness of the importance of reducing energy consumption. Chiang Mai urges citizens to join in by turning off their lights and save energy by refraining from using electricity. Earth Hour is also yearlong competition that calls on cities to reduce their power consumption in innovative ways, this year three Thai cities reached the final 44 in the Earth Hour City Challenge; Hat Yai in Songkhla Province, Khon Kaen municipality and Mapammarit municipality in Chumphon. Earth Hour started in 2007 as a lights-off event to raise awareness about climate change and has since grown with more than 162 countries involved. After holding meetings with nine Northern governors on March 11, 2015 Lt. Gen. Sathit Pittharat and Minister M.L. Panadda Diskul chaired the opening ceremony to release the water trucks and helicopters from Wing 41 to spray water into the air. Minister to the Prime Minister’s Office M.L. Panadda Diskul flew up from Bangkok to meet with Lt. General Sathit Pittharat Commander of the Royal Thai Army Region 3, regional governors and deputy governors on March 11, 2015 as the haze crisis deepened across the North. The government officials also met with organizations that have been working to fight forest fires and burning in the nine Northern provinces. Chiang Mai, Chiang Rai, Lampang, Lamphun, Phayao, Mae Hong Son and Chiang Rai are affected annually by smoke and smog caused by forest fires, agricultural fires and haze. Nearby provinces are expected to suffer from the haze as it spreads further. Record highs of PM10 numbers were recorded in Mae Hong Son, which hit 318, Lampang hit 260 and 253 in Chiang Mai in March. Lt. Gen. Sathit Pittharat said that since the forest fires have been a problem since 2003, Her Majesty the Queen has been very worried and has ordered the Commander in Chief of the Royal Thai Military forces to contact organizations involved to help solve the problem. Royal Thai Army Region 3 has been given the authority to establish a specific Headquarters of combined forces to control the forest fires and air pollution since 2007 in Chiang Mai. Since the HQ was established, all organizations involved have worked together and governors of each province must often organize brainstorm meetings to tackle the issues and cooperate with local authorities to stop the fires. 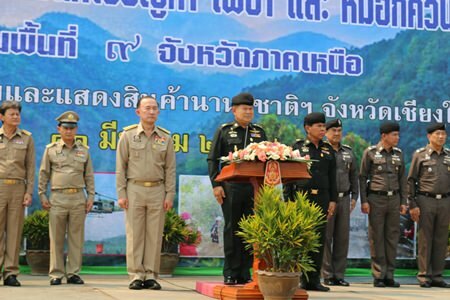 Local authorities and organizations involved must find out what caused the forest fires in order to prevent it from happening again.The Prime Minister has also given orders to Army Region 3 to meet with organizations involved in the 9 Northern provinces. The forest fires and air pollution has always been a major problem and has affected the health of residents. The Army has been using all their equipment to ease the situation, including using t helicopters to fly above and sprinkle water around the areas as well as using water trucks. Singapore has sent two Apache Helicopters to help fight forest fires and spray water into the air to bring down the smoke and dust. The Army Commander has asked for cooperation from the governors of the 9 northern provinces to contact the district chiefs and raise the awareness of residents and ask them to report any potential hotspots to prevent fires from spreading. Police Region 5 has already agreed to cooperate to support this matter as well. From investigating and contacting organizations involved, the forest fires and air pollution had mostly local causes but the government has also contacted Myanmar to block fires along the border with Chiang Rai. The government will institute projects to prevent crop burning and fires in agricultural areas in the near future. Japanese Consul General Akihiko Fujii signs a funding contract with Ms. Achara Chienvichai, Director of the McKean Rehabilitation Center to provide rehab facilities for disabled patients. The Government of Japan, under its Grant Assistance for Grassroots Human Security Projects Scheme (GGP), is providing funds amounting to 2,981,300 baht for “the Project for the Improvement of a Rehabilitation System of Disabled Patients in McKean Rehabilitation Center in Muang District, Chiang Mai Province”. 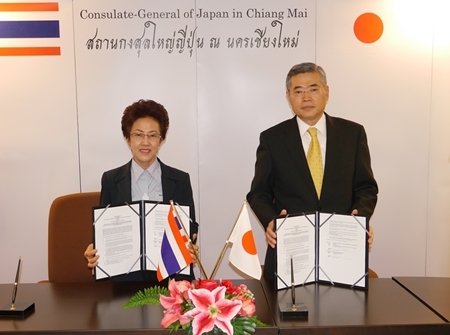 On 13 March, 2015, Mr. Akihiko Fujii, Consul-General of Japan in Chiang Mai, and Ms. Achara Chienvichai, Director of the McKean Rehabilitation Center, jointly signed the funding contract at the Consulate-General of Japan in Chiang Mai. According to data from the National Statistical Office of Thailand in 2007, there were almost 1.87 million disabled people in Thailand, of whom 45% were physically disabled. In the same year, the Persons with Disabilities Empowerment Act 2007 entered into force to form the framework for a comprehensive institutional model to support disabled people. However, the present support system is not sufficient. In 2010, there were only 7 Centers for Independent Living in the whole country, with the capability to support 1,000 disabled persons. McKean Rehabilitation Center was originally established as a center for leprosy sufferers by Dr. James McKean on Kho Klang, an island in the Ping River. In 1908 the center received government approval as a medical institution for leprosy sufferers. After specific medicines for leprosy were developed and the government had improved the care for leprosy sufferers, the center changed its management policy to provide care not only for leprosy sufferers but also for physically disabled persons such as polio patients, multiple Sclerosis patients and those who suffer accidental injury etc.. The center has provided various kinds of voluntary support for the independent living of persons with disabilities, such as rehabilitation to recover physical functions, to develop, produce and provide prosthetic devices suitable for the disabilities of each person, and employment support in cooperation with government sectors. These activities to promote the independent living of persons with disabilities contributes to improve their quality of life as well as to reduce the burden on their families. However the center has insufficient budget to renew aging rehabilitation devices and vehicles because most of the rehabilitation section’s income comes from donations. In response to a request from the McKean Rehabilitation Center, the Government of Japan will bear the costs of purchasing a high-roof type van with wheelchair elevator and rehabilitation devices. It is expected that this support will contribute to ensuring the improvement of the rehabilitation system in the center as well as support for the independent living of persons with disabilities and the maintenance of quality of life in the aging society in Chiang Mai City and the nearby area. Philippine Honorary Consul Agkarajit Phanomvan na Ayudhya and Mrs. Linda Khampan, Representative from the Filipino community in Chiang Mai visited with Asst. Prof. Dr.Chamnian Yosraj, President of Maejo University to discuss a recent MOU signed to extend cooperation. Philippine Honorary Consul Agkarajit Phanomvan na Ayudhya and Mrs. Linda Khampan, Representative from the Filipino community in Chiang Mai, called on Asst. Prof. Dr.Chamnian Yosraj, President of Maejo University (MJU) to discuss developing educational cooperation between ten Philippine schools and Thai schools. Together with Asst. Prof. Dr. Yongyooth Srigiofun, Acting Vice-President for International Affairs and Asst. Prof. Dr. Kriangsak Meng-amphan, Representative of Philippine Alumni at Maejo University, the group discussed on educational co -operation between the Philippines and MJU. 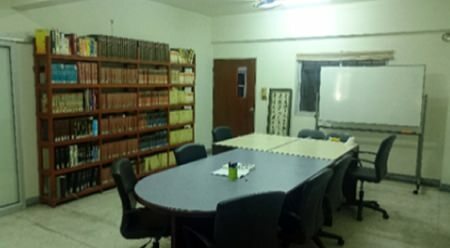 Maejo University signed a memorandum of understanding to exchange academic and research information and developments and the exchanges of scholars and faculties with 10 Philippine institutions including the International Rice Research Institute (IRRI) and Southeast Asian Committee for Advocacy (SEACA). Moreover, MJU has 26 members of their faculties who graduated from Philippine universities. Both parties agreed to enhance the development of agriculture and tourism and to support the activities of the Filipino community in the North and develop networks in Chiang Mai. The Office of the Prime Minister has launched two new hotlines for international tourists and residents, said Minister M.L. Panadda Diskul recently. The contact for police complaints will connect people to the tourist police at 1155. The hotline to connect to other various government agencies is 1111. Both lines will be open twenty four hours a day and will have interpreters on hand to handle complaints and issues. The Minister noted that several agencies already have their own hotlines but that they often overlap and duplicate work. The new 1111 hotline will handle all non-Thai residents and visitors complaints, concerns and issues regardless of the department except, of course for police issues. 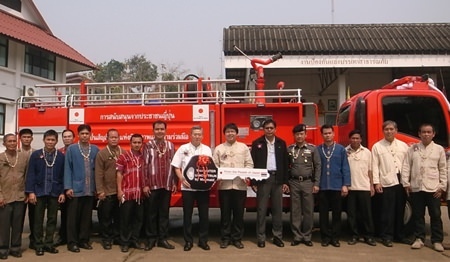 Akihiko Fujii, Consul-General of Japan in Chiang Mai, and Mr. At Somyot, Mayor of Mae Chaem Sub-District Municipality with the new fire truck for Mae Chaem. The Government of Japan, under its Grant Assistance for Grassroots Human Security Projects Scheme (GGP), has provided funds amounting to 2,952,000 baht for “The Project for Procurement of a Fire Engine in Mae Chaem Sub-District Municipality in Mae Chaem District, Chiang Mai Province”. On March 10, 2015, Mr. Akihiko Fujii, Consul-General of Japan in Chiang Mai, and Mr. At Somyot, Mayor of Mae Chaem Sub-District Municipality, were present at the hand-over ceremony of the fire engine at Mae Chaem Sub-District Municipality. In Mae Chaem District, some 80 percent of the total land area is covered by forest, much of which is designated as national forest or national parkland. Every dry-season, forest fires break out and result in serious health problems from haze and loss of forest acreage. In order to minimize forest fires and the damage they cause, Mae Chaem Sub-District Municipality has to engage in the activities of firefighting, disaster prevention and rescue through volunteer fire corps recruited from among local residents. The scope of their activities covers the entire area of Mae Chaem District because they are the only municipality possessing a fire engine in the whole District while the other sub-district administration organizations only possess individual water tank trucks. When a fire breaks out, the Municipality's fire engine and water tank trucks of the relevant sub-districts need to co-operate to tackle the fire. However, the old fire engine had become so decrepit after 33 years of service that it was of limited use in helping the fire corps conduct expeditious and effective operations. 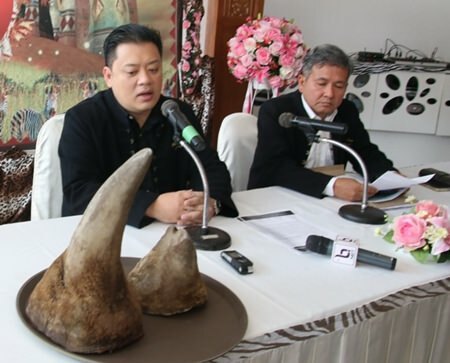 Dr. Sarawut Srisakun, Director of the Pinkanakorn Development Agency, Director for Animal Management Weerapol Boonchuduang and Chatree Khutheparak head of the Conservation Veterinary announced the investigation into the death of a white rhino in February at the Chiang Mai Night Safari. Dr. Sarawut Srisakun, Director of the Pinkanakorn Development Agency was joined by the Director for Animal Management Weerapol Boonchuduang and Chatree Khutheparak head of the Conservation Veterinary at the Chiang Mai Night Safari held a press conference to explain the death of a white rhinoceros at the Night Safari on February 17, 2015. The 13 year old male was named Roger and veterinarians performing an exam to find cause of death found a perforation in his stomach which caused an infection, although the cause of death is not verified it is possible that an infection like this can affect the gastrointestinal system. The food found in the rhino’s intestines was dry and hard. There was also damage to the intestines, and spleen, judging from the amount of bleeding found. Veterinarians suspect the rhino may have battled with other rhinos but a necropsy will be carried out at the Laboratory of Veterinary Science to determine exact cause of death. The food remaining in the stomach will be sent to the laboratory at the Institute of Animal Health, Lampang to check for any toxic substances. Master Sergeant 1st Class Sarawut Thanarakudonporn was charged with drug trafficking in Chiang Dao on March 7, 2015 after police found 4,400 methamphetamine pills in his truck. 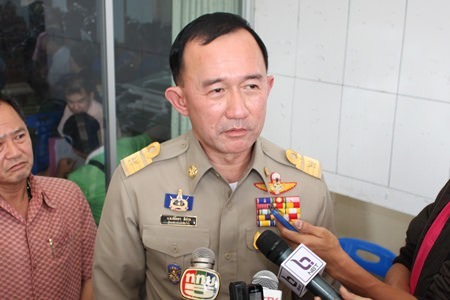 A master –sergeant in the Royal Thai Army was arrested in Chiang Dao on March 7, 2015 after police uncovered 4,400 methamphetamine or Yaba pills hidden in his belongings in his pickup truck. Police stopped Master Sergeant 1st class Sarawut Thanarakudonporn of the Third Army, 7th Infantry Division after he acted suspiciously at a checkpoint set up in Chiang Dao near Khan Pha Thao. Police found 2,000 Yaba pills hidden in a pair of combat boots in the truck and a further 2,400 pills in a bag on the seat. 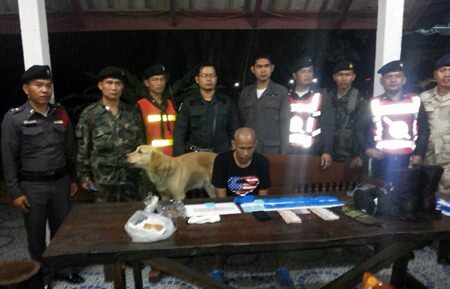 Police arrested the suspect who confessed that he had purchased the drugs in Chiang Dao and intended to sell most of it in Lamphun and leave some for himself. Volunteers and government officials took part in drill training including evacuations in preparation for potential earthquakes. An earthquake drill and training session was held in Chiang Rai on March 6, 2015 to prepare officials and related organizations on how to cope with victims in case of an earthquake disaster. Deputy Chief of Defense Forces General Wuttinun Leelayudth and Deputy Director of the Office of Disaster Prevention and Mitigation Anusorn Kaewkangwal traveled to Chiang Rai to oversee the progress of the drills and training in the JDMEX 2015 operation. The training included 7 different organizations; the Military Training Center, the Department of Disaster Prevention and Mitigation, the National Disaster Warning Center and other organizations who help victims in natural disasters including Rescue Units and Volunteers. Preparedness and skills of participants were evaluated and trainees took part in evacuation exercises and how to contact organizations for help. Chiang Rai was struck by the strongest earthquake to affect Thailand on May 5, 2014 at Mae Lao, Chiang Rai. The earthquake, which measured at 6.1 with the USGS, caused massive destruction in the area, with over 730 aftershocks, and claimed the lives of 2 victims. 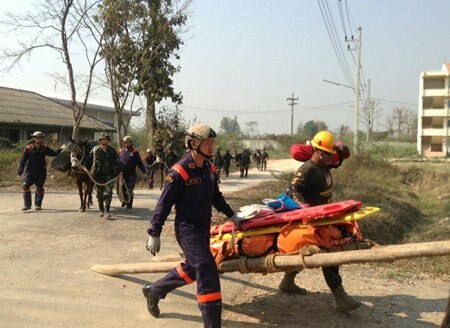 The quake affected 7 provinces including Chiang Rai, Chiang Mai, Phayao, Nan, Phrae, Lampang and Kampaeng Phet. In Chiang Rai a total of 7 districts, 47 sub-districts, and 478 communities reported 8,935 damaged locations in total, including 116 homes that were completely destroyed, 8,463 damaged homes, 99 temples, 7 temples, 35 schools, 1 university, 25 hospitals, 6 factories, 1 hotel, 5 roads, and one bridge. 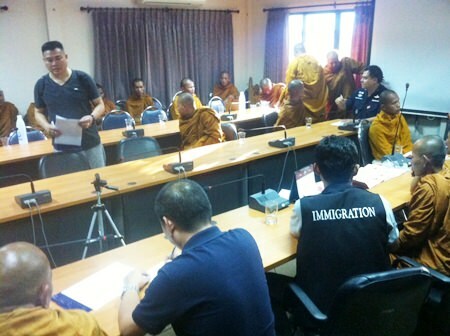 Immigration police will be deporting twenty Cambodian Buddhist monks who entered the country illegally. Police rounded up a group of undocumented Cambodian monks after residents in the Baan Bong area reported their presence to police who were in the area checking for human trafficking and other criminal activities. The Saraphi villagers told police that a large group of unknown monks were in the area begging for food in the area. On March 6, 2015 Pol. Maj. Gen. Bandit Thunkaseranee, Chief of the Immigration Police Region 5, Pol. Col. Rujpong Sarawaranangkul, superintendent of the of the Chiang Mai Immigration Police, Pol. Lt. Col. Udom Suwanleka, deputy superintendent of the Chiang Mai Immigration Police and a number of other officers and military members visited the area to patrol where they received a report from residents that a large group of unidentified Buddhist monks were seen around the community. Police found a group of 20 Buddhist monks from Cambodia who had entered the country with no documentation. They told police they had crossed into Thailand in Sa Kaeo where they met up with other members and traveled to Chiang Mai to ask residents in the area to make merit. Police and military members have taken the group of monks to the Chiang Mai Immigration Office and will deport the Cambodian monks out of the country. 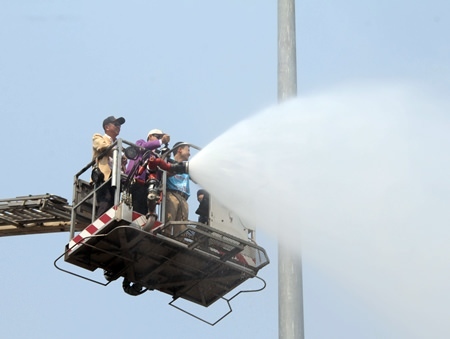 Government officials have started spraying water in an attempt to bring down dust and large particles in the air due to smog. 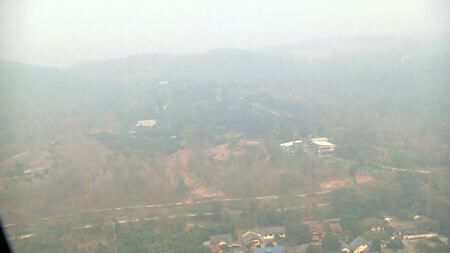 The Chiang Mai government began spraying water into the air around the city in an attempt to bring down large particle levels in the air due to burning in the region. On February 3, 2015 Governor Suriya Prasatbuntitya chaired the launch of the campaign with Boonlert Buranupakorn, President of the Chiang Mai Provincial Administration Organization, representatives from the Office of Disaster Prevention and Mitigation as well as other government officials. The government took their cue from Kuala Lumpur and Singapore which spray water during periods of serious smoke to add moisture to the air, lower dust and large particle levels. The government issued a 60 day no burning period from February 15 to April 15, 2015 in an attempt to bring down annual smog that affects health, the economy and tourism. The Governor has asked agencies to cooperate in fighting fires and called on residents to help by not burning and reporting fires. Chiang Mai Department of National Parks - 053-276-100. The Office of Environmental Protection - 053-112-725. The Charity Golf Tournament organized by the Faculty of Medicine CMU raised over 3.8 million baht to support the Mor Jao Fa project. 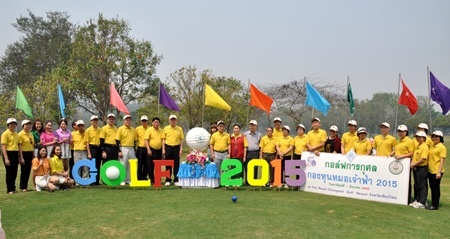 The Faculty of Medicine at Chiang Mai University held a charity golf tournament to raise money for the Mor Jao Fa fund at the Royal Chiang Mai Golf Resort. The Fund donates money for scholarships for students in the medical field including medicine, dentistry and even veterinary. The funds go towards supporting the Foundation of Voluntary Doctors. The tournament was held on March 1 and chaired by Governor Suriya Prasatbuntitya. There were 68 teams competing for the HRH Princess Galyani Vadhana Trophy. Thirty six teams played in the morning and 32 in the afternoon. Teams played in team and individual categories as well as other competitions. The winner in the team category were the Pha Chom Golf Club Sirikit Dam who won the royal trophy while individual went to Dr. Pracha Panyaprasit from Chiang Mai Ram Hospital. Many other players and teams won in various categories. The event raised over 3,890,700 Baht and will be supporting the Mor Jao Fa Funds project according to the wishes of Her Royal Highness Princess Galayani Vadhana Krom Luang Naradhiwas Rajanagarinda. 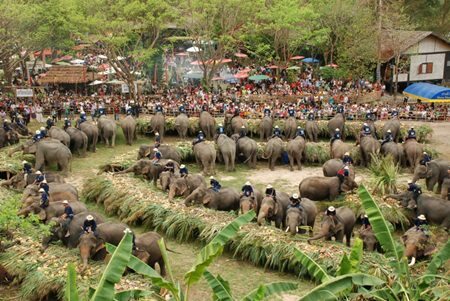 Elephants will be treated to a feast of sugar cane, bananas and other treats on National Elephant Day on March 13 at several elephant camps in Chiang Mai at the Mae Sa Elephant Camp in Mae Rim where the Faculty of Veterinary Science at Chiang Mai University will be taking part. Additionally there will be a special blessing ceremony and people will get the chance to meet the elephants. The day was established in 1998 to raise awareness of the importance of the elephant in Thailand and to promote their protection and conservation. Prof. Dr. Weerapong Paesuwan, the Permanent Secretary of the Ministry of Science and Technology Thailand and Professor Chao Jien Lin, Deputy Minister of Science and Technology of China signed an agreement to promote the development of four projects in science, technology and innovation. 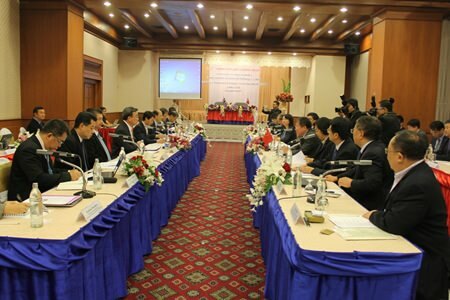 The Ministry of Science and Technology Thailand and the People’s Republic of China signed an agreement on March 2 and 3 at the Lotus Pang Suan Kaew Hotel to promote four projects in science, technology and innovation. Prof. Dr. Weerapong Paesuwan, the Permanent Secretary of the Ministry of Science and Technology Thailand and Professor Chao Jien Lin, Deputy Minister of Science and Technology of China chaired the committee meeting and signing. The two countries are committed to developing cooperation in science and technology with the Science and Technology Partnership Program (STEP) and will work on developing cooperation on the Thailand – China Joint Research Center, the Remote Sensing Satellite Data Service Platform, the Thailand - China Technology Transfer Center-TCTTC and the Talented Young Scientist Visiting Program-TYSP. There will also be a 2nd meeting in Thailand to update the progress of all 4 programs. Thailand has handed over the project to the Committee Office of National Science Technology and Innovation and will work to bring about exchange visits to explore in Thailand and China. Thailand is supporting the China-ASEAN Science Technology and Innovation Policy Collaboration Network and the Geo-Informatics and Space Technology Development Agency to be the working committee in the Space Technology Application. The groups involved intend to promote science, technology and innovation to promote business and the economy. The head of the Disaster Prevention and Mitigation Department Pachanitha Sadudee reports on the drought situation in Chiang Mai. 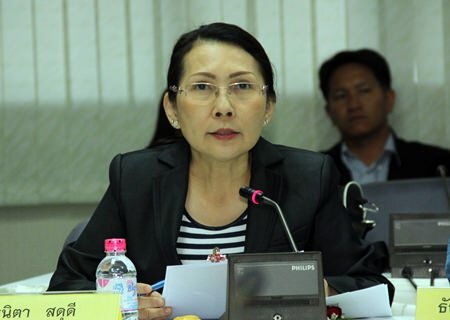 The head of the Disaster Prevention and Mitigation Department Pachanitha Sadudee said that five districts in the province are reporting drought conditions; Mae Rim, Hang Dong, Chiang Dao, Doi Tao and Doi Loh while four more are reporting effects on agriculture from the dry weather. Those include Hod, Samoeng, Phrao, and Mae Chaem. The government set up the Center to Prevent and Aid Drought in October 2014 and now covers all 24 districts and involves the Disaster Prevention and Mitigation Department Chiang Mai, the Water Supply Department, Military Circle 33, Wing 41 and many Municipality Offices in the area. In the five districts affected by drought there are 13 municipalities and over 18,000 families and 680 rai of farmland. Fish farms are also suffering due to the drought. The government will request assistance form the Ministry of the Interior and other organizations to help water supply in the affected areas. Doi Suthep disappears behind a fog of smoke and haze as pollution levels in Chiang Mai started climbing at the start of March. Governor Suriya Prasatbuntitya called an emergency meeting of all relevant government organizations on Tuesday, March 03, 2015 to discuss the soaring pollution levels in the first few days of March. As PM10 levels climbed on February 28 and March 1 in part due to forest fires at Doi Saket and Doi Suthep as well as farmers burning fields around the region, the Governor called a meeting to discuss ways to tackle fires and cope with the haze. The Governor noted that analysis of satellite data showed fires in southern Chiang Mai, as well as winds blowing smoke into Chiang Mai city, which lies in a basin. The Chiang Mai Municipality used water trucks to spray water in a bid to reduce dust in the city on Tuesday as PM10 levels hit 181 at Yupparaj Wittalayai School and 163 at City Hall. The Governor has urged members of the public to report fires and promised a 5,000 baht reward for those who turn in people caught setting fires. Lampang, Phrae and Mae Hong Son also saw unhealthy levels of pollution as fires in the area cast heavy smoke across the region. Phrae reached 215 micrograms per cubic meter while Mae Moh in Lampang reached 260. The Thai government sets the safety standard at below 120. The Northern Royal Rainmaking Operation Center director said that while there have been no requests for the center to begin rainmaking the humidity levels, which sit below 30 percent, are too low to operate rainmaking flights. The Airports of Thailand have announced plans for expanding both domestic and international terminals as well as adding more parking bays, increasing baggage handling machinery and adding another parking lot. In the short term new parking bays are already being added and the domestic departure hall will be expanded by 400 sqm and the international departure hall by 350 sqm this year. The new parking lot should hold up to 320 vehicles. The terminals will be expanded further in 2016 with the domestic departure hall expanding by 1,600 sqm and the international passenger terminal by 20,000 sqm. The bus gate will be improved and more air bridges as well as baggage carriers will be added in 2016. 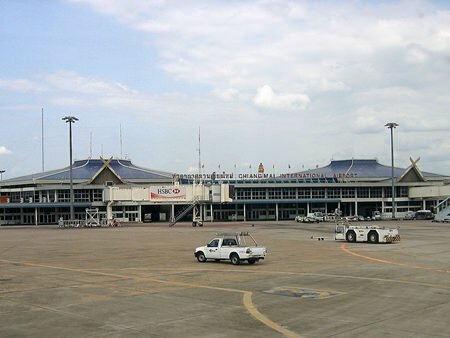 Chiang Mai International Airport has seen a huge increase in income, earning over 1.2 billion baht in income, a 35 percent increase year on year. The airport saw a 21 percent increase in passengers in 2014 over the previous year. Mr. Akihiko Fujii, Consul-General of Japan in Chiang Mai, Mr. Jaroon Jittiwutikarn, Chairman of Ruam Mit Foundation for Youth at the opening ceremony of the Rehabilitation Center of Ruam Mit Foundation for Youth in Amphur Muang, Chiang Rai on February 26, 2015. The Government of Japan, under its Grant Assistance for Grassroots Human Security Projects Scheme (GGP), has provided funds amounting to 3,196,100 baht for “The Project for the Rehabilitation of Children with Cerebral Palsy in Chiang Rai Province”. 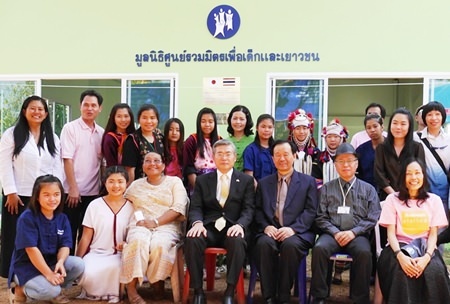 On February 26, 2015, Mr. Akihiko Fujii, Consul-General of Japan in Chiang Mai, Mr. Jaroon Jittiwutikarn, Chairman of Ruam Mit Foundation for Youth were present at the opening ceremony of the Rehabilitation Center of Ruam Mit Foundation for Youth at the center built in Amphur Muang, Chiang Rai. There are almost 16,000 handicapped people registered in Chiang Rai province, 200 of whom have Cerebral Palsy. Children with Cerebral Palsy are found much more among poor and highland ethnic group families because of teenage pregnancy and hard work during pregnancy. In particular, the handicapped children without citizenship have difficulty in receiving the protection and rehabilitation affirmed in the human rights charter and lose their chance for recovery and self-reliance. The Ruam Mit Foundation for Youth has carried out rehabilitation training for children with Cerebral Palsy and their parents in cooperation with Mae Lao and Mae Fah Luang hospitals in Chiang Rai province since 2011. As a result the children recovered remarkably and regional rehabilitation network for the children is being created. In response to a request from Ruam Mit Foundation for Youth, the Government of Japan provided funds for the construction of a rehabilitation center and the running of a rehabilitation program for children with Cerebral Palsy by the Foundation. It is expected that this will enhance support for handicapped children in Northern Thailand. Dr. Sarawut Srisakun, acting director of the Pingkanakorn Development Agency and Kanchanachai Saenwong, director of Chiang Mai Zoo exchanged animals at the Night Safari on February 19, 2015. The Chiang Mai Night Safari gave three gorals to the Zoological Park Organization on February 19, 2015 and received three five-color lemurs in return. Dr. Sarawut Srisakun, acting director of the Pingkanakorn Development Agency and Kanchanachai Saenwong, director of Chiang Mai Zoo joined the ceremony to exchange the animals for conservation and research into breeding. Dr. Sarawut said that the Night Safari was honored to receive the lemurs from the Zoological Park Organization and establish a good relationship between the two organizations. He added that it is a great way to propagate rare animals for other zoos in Thailand and conserve rare animals. The five-color lemurs included one 4 year old male lemur named Kinje, one 6 year old female lemur named Ngam and a 5 year, 2 month old female Ngok. The 5-color lemurs are some of the most beautiful and rare animals in the world and originate from Madagascar. The color of the lemur is dark gray or black in color, even in places where the fur is white. It is exposed on the nose, palms, soles, eyelids, lips and its neck has a mixed color. A male lemur has more fur around its waist on both sides and is bigger than a female. Lemurs are often together in groups and are found on the top of trees while they feed themselves during the day. Many lemur species are threatened with extinction due to habitat loss from illegal logging and hunting. The lemurs will be looked after by the Bureau of Animal Management. They will also be available for tourists to see and explore the uniqueness of the animals. Governor Suriya Prasatbuntitya opened the new Anti-Corruption Center on February 24, 2015, the new center will take complaints from people in regards to corruption in the government. 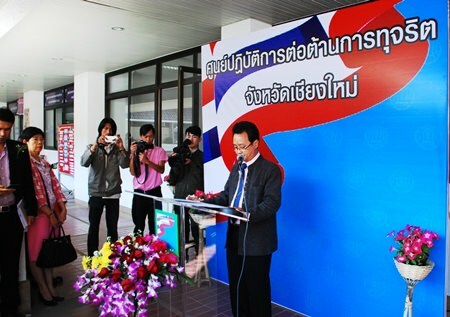 Governor Suriya Prasatbuntitya opened the new Anti-Corruption Center at Chiang City Hall on February 24, 2015 and also signed an agreement to cooperate on preventing and combatting corruption in the province. The Governor said that the new center is supported by all organizations involved to respond to the government policy to prevent and fight corruption in the government. The Anti-Corruption Center will serve as a contact center for people who are taken advantage of by civil servants or employees of any government agency and will evaluate and monitor each report. The Governor, the Deputy Governor and heads of government agencies will discuss important issues brought to the center and pass them on to district chiefs, community leaders and also individuals in the area to be clean and not take advantage of citizens. Japanese Consul General Akihiko Fujii and Assoc. Prof. Dr. Niwet Nantajit, President of Chiang Mai University signed an agreement that the Japanese government will provide funding for the renovation and improvement of the Japanese Study Center at CMU. Chiang Mai University signed a memorandum of understanding with the Japanese Consulate General in Chiang Mai to improve the facilities as the Japanese Study Center recently. The MOU was signed by Japanese Consul General Akihiko Fujii and Assoc. Prof. Dr. Niwet Nantajit, President of Chiang Mai University (CMU). The project, which will begin implementation on March 2, will provide 3 million baht to improve the facilities of the Japanese Study Center at CMU. Renovations of existing space will allow for separate rooms for visiting teachers and students from Japan to study and research. Other rooms will be repurposed as classrooms, meeting rooms and multipurpose rooms. Equipment for the rooms will be purchased and fittings for the rooms as well. The Japanese government also donated funds for the establishment of the Center in 2008. Recently, local resident Heather Crofskey lost her son to cancer and was naturally devastated by the event. Her late son was a good guitar player and he had acquired four acoustic guitars with electronic connections. 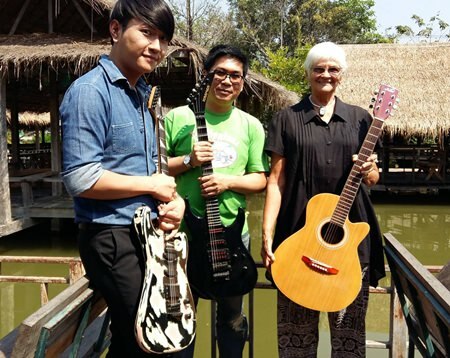 Heather asked Chiang Mai’s resident musicologist Jean-Pierre if he had any ideas about using the guitars for the benefit of others in the community and it was decided to donate three of the instruments to the Santi School of Music. Heather’s son Grant had attended a number of functions at the school with his mother so this was a most appropriate arrangement. It was also a generous gesture by Heather who decided to keep one of the instruments as a piece of memorabilia as it had been specially engraved. The other three were handed over to Ajaan Santi Saengthong, the school’s founder and his office manager Ken over lunch at a local countryside restaurant on Monday February 23rd. The Thai Red Cross launched a nationwide appeal for blood donations as supplies have reached critically low levels. Hospitals have been forced to postpone surgeries due to a lack of supply and the Thai Red Cross has only been able to supply 2000 units of blood daily, far below the basic minimum of 3,000 units. Blood donors in Chiang Mai can donate at the Thai Red Cross branch at 369-371 Wichayanon Road, A Muang, Chiang Mai 50300. Tel: 053 235161, 053 235574. Donations can also be made at Sriphat Medical Center next to Chiang Mai Maha Nakorn Hospital or any provincial hospital. Earth Hour to be held March 28 at 8:30 p.m.